After taking a weekend off to celebrate Canada Day AFL Ontario action returns with the Toronto Dingos taking on the High Park Demons at Humber College South (map) this Saturday July 8th. Ball-up is scheduled for 3:00pm. Both teams got their sole win of the season so far against the Grand River Gargoyles in round five and will be desperate to get another win on the board. For the Demons their round five win against the Gargoyles (8.13-61 to 5.7-37) was a long time coming, but they were quick to point out that this now gives them a 100% win rate in their new kit and will surely have some newfound wind in their sails. 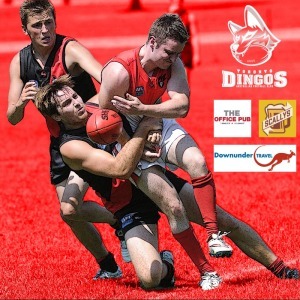 For their part the Dingos fought hard in their round five clash with the Central Blues but couldn’t get it done falling away in the final quarter (8.8-56 to 5.9-39). They’ll be looking to find that extra gear to share the load and run through all four quarters of this one, with a win sorely needed with the upcoming road trip to face the Ottawa Swans looming.